Earlier this year, I acquired a tandem kayak for the specific purpose of introducing my grandchildren to the activity. From my outdated perspective, there is far more adventure to be had in a kayak on a river than there is to be had in a theatre seat with a tub of greasy popcorn at a Marvel superhero movie. 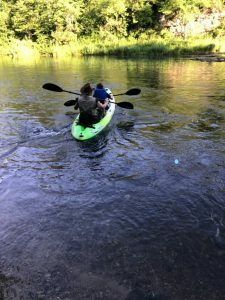 I made my maiden voyage on the Kinnickinnic River on May 22. All systems go! 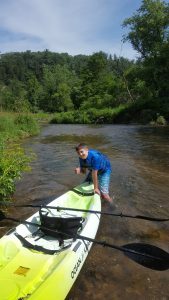 In June, I was able to coordinate a trip for my 12-year old grandson Travis. Lyla and Xylia, my 8-year old and 11-year old granddaughters from Arizona arrived at 0145 on July 5th to spend a week in Wisconsin. 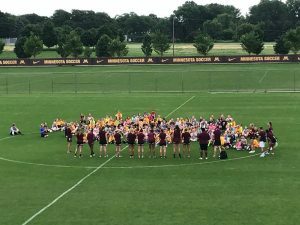 As I write, Lyla is attending Aunt Stef’s Gopher Soccer Camp at the University of Minnesota. 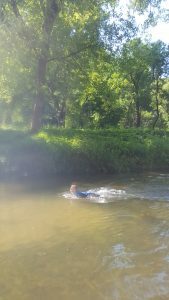 Yesterday, Xylia and I did the 12-mile run down the Kinnickinnic from Glen Park in River Falls to the bridge on Highway F near the Kinnickinnic State Park. The kayak adventures were both a rousing success. 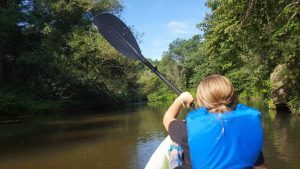 Both Travis and Xylia learned to row and to ‘negotiate’ the river. With a bit more practice, they will be able to handle the river solo. To keep it in perspective, the Kinnickinnic has around 60 Class I rapids and a handful of Class II rapids. The Class II rapids could cause difficulties if one is inattentive to the situation. Xylia became particularly adept at the ‘back rowing’ technique to initiate sharp, quick turns. The river takes us through a Bald Eagle Preserve, and the majestic creatures are always cooperative. Travis and I rounded a bend and spotted a Bald Eagle waiting patiently on a tree about 50 yards away. As we approached, he swooped down directly toward us and flew less than 20 feet above us. Xylia and I were blessed with a pair of Bald Eagles who stayed with us flying back and forth across the river for about 10 minutes. e average depth of the river at two feet, but we do encounter ‘pools’ that are four and five feet deep. When we found one, we pulled over and Xylia enjoyed her swim. Both grandchildren are ready to do it again, and I am willing to oblige. 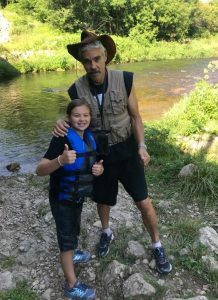 There is nothing like a real live adventure on the river with a grandchild. 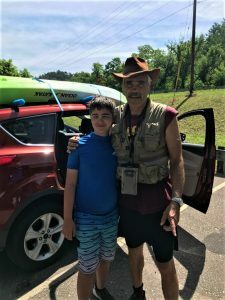 Gene enjoyed seeing your kayaking adventures with your beautiful grandchildren. What a great way to spend a day. It brought back memories of fishing with my 4 year old grandson on Onota Lake (he’ll be 19 next month). We started by digging up the worms. There are now eagles on Onota. They were first seen about 10 years ago and, I understand< are now well established.